Abu Dhabi: The first solar flight on a global trip may take off from Abu Dhabi on Saturday (March 7), subject to weather conditions. As part of the preparations for the planned take-off, the two Swiss pilots successfully completed a training flight on Monday morning in Abu Dhabi, an executive of Solar Impulse, the organisation that made the solar flight Solar Impulse-2 (Si2), told Gulf News. “It was the fourth test flight of Si2 and the first training flight of Bertrand Piccard and André Borschberg [who will fly the Si2 across the globe]” said Alexandra Gindroz, Media Relations Manager at Solar Impulse. The first three test flights were done by professional pilots to confirm the performance of the aircraft. Monday’s flight was a training for both the pilots before the actual take-off, she said. Piccard and Borschberg will take turns as pilots of the airplane powered by solar energy on a first-of-its-kind journey in the history of aviation. Si-2 will fly day and night, and land in 12 locations across the world in its five-month-long journey to promote renewable energy. They will travel 35,000 kilometres in the first attempt to fly around the globe without using a drop of fuel. Si2 is expected to return to Abu Dhabi by late July or early August. The route includes stopovers in Muscat in Oman; Ahmedabad and Varanasi in India, Mandalay in Myanmar, Chongqing and Nanjing in China. After crossing the Pacific Ocean via Hawaii, Si2 will fly across Continental US stopping over in three locations — Phoenix and New York City at JFK. A location in the Midwest will be decided depending on weather conditions. After crossing the Atlantic, the final leg includes a stop-over in southern Europe or North Africa before returning to Abu Dhabi. Piccard earlier said although a commercial solar fight is a remote possibility, a four- or five-seater flight for short trips may be a possibility in the near future. 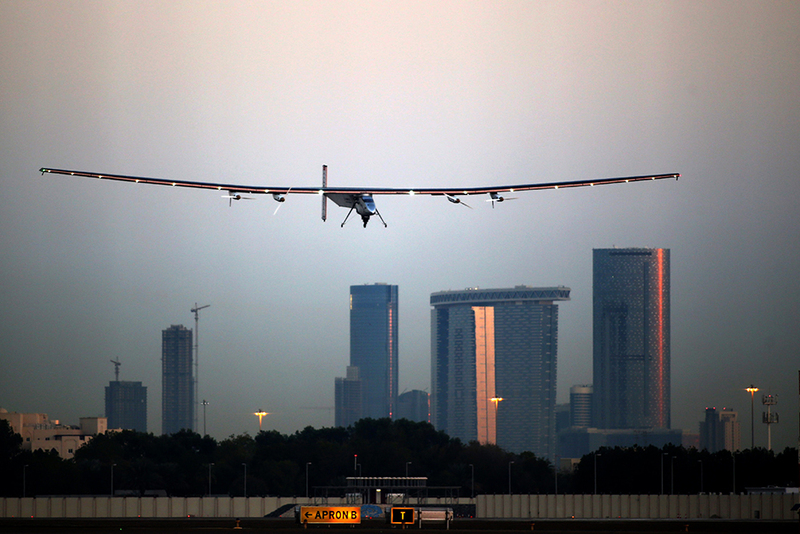 Si2 aims to raise awareness about the potential of clean energy. Si2 has used many innovative technologies that can improve people’s lives in many sectors. The technology used for building the cockpit can triple the capacity of refrigerators. Lighting of the flight is the most energy-efficient technology. Solar Impulse’s host partner Masdar, Abu Dhabi’s renewable energy company, is facilitating preparations for the historic flight. The aircraft parts were transported from Switzerland by Masdar and assembled in the UAE.